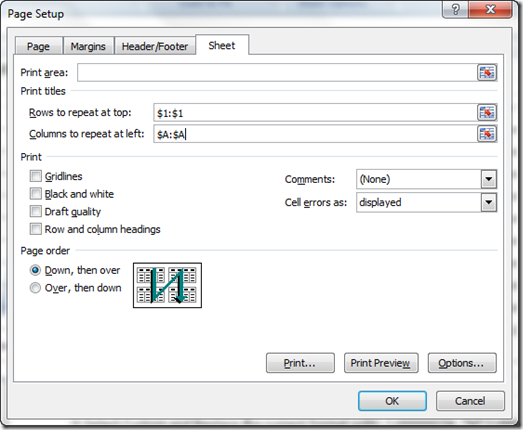 Home Print Columns How do I Print Repeating Rows or Columns for my Excel Report? How do I Print Repeating Rows or Columns for my Excel Report? 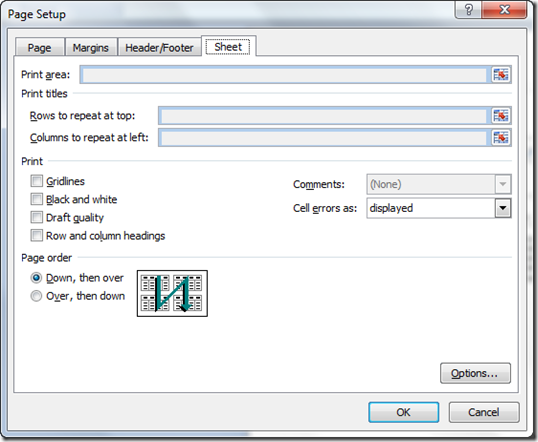 The quickest way to add repeating Row Headings or Column Headings when you print a Dashboard is to use the Print Titles feature in Excel. The print titles allow you to select one or many rows or columns that will repeat on every page of the Company Dashboard Report. Since we are discussing a printing, you will want to go to the Page Layout Ribbon in Excel 2007 and select the Print Titles option from the Page Setup Group. As show above, you can enter the Print Columns to Repeat at Left or Rows to Repeat at Top when you print your Executive Excel Dashboard. 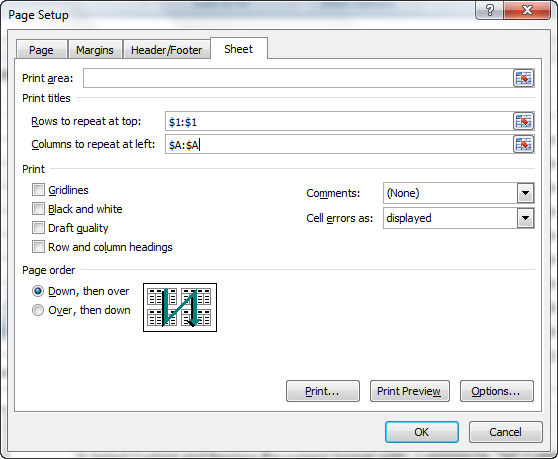 For the Rows, you can enter $1:$1 to repeat the first row at the top of every printed page. If you enter $1:$2, it will repeat the top 2 rows on every printed page. Alternately, you can just click and drag the Rows in your spreadsheet that you want to repeat and Excel will fill it in for you. For the Columns, you can enter $A:$A to repeat the first column at the left of every printed page. If you enter $A:$B, it will repeat the 2 left columns on every printed page. Alternately, you can just click and drag the Columns in your spreadsheet that you want to repeat and Excel will fill it in for you. Why are they greyed out? 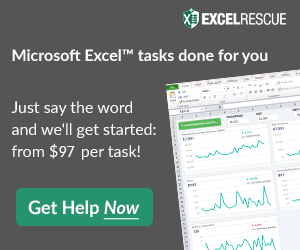 This is the problem that the Excel Forum user was having. So what is going on? Turns out the user entered the Page Setup Area from the Print Preview pane. For some unknown reason to me, Excel will not let you choose print titles this way. The Print Titles for both Rows to Repeat at Top and for Columns to Repeat at Left will be greyed out. I assume that Excel does not let you do this because it would need to have the protocol to take you out of print preview mode to select the Row or Column Print Titles. I would imagine this could be an easy fix. 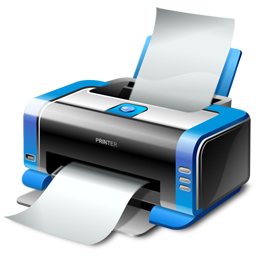 But unfortunately you must leave the Print Preview area and return to the Spreadsheet View in order to change or add Print Titles. If anyone knows the real reason why Excel doesn’t allow you to set the Print Titles from the Print Preview pane, please leave me a comment. Maybe it was fixed in Excel 2010. Does anyone know that has 2010? Until it is fixed however, you can access this menu as I describe above. Please don’t forget to leave me a comment if this was helpful and please sign up for my email distribution through the RSS Feed so that you can get the most current posts. Also, I will have a really cool dynamic excel template product launching soon. So stay tuned!